Immortality doesn't come often and once is enough for most swimmers, but not for Captain Matthew Webb, who was first to swim the English Channel in 1875. This feat was an accomplishment of the impossible, according to all estimates up to that time. Many tried but it was 36 years before anyone else (Burgess, 1911) ever made it across the Channel. But Webb was not around to greet No. 2. Webb's feat lasted 28 years longer than he did. 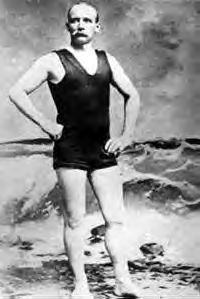 In an effort to bolster lagging attendance for his vaudeville act in 1883, just 8 years after his Channel swim, Captain Webb decided to try for immortality a second time by swimming across the rapids just above Niagara Falls. Once again considered opinions said, "impossible" and this time they were right. Webb is buried at Niagara Falls, Ontario. After covering himself with porpoise oil to keep warm, Webb, trailed by a flotilla of three boats, entered the water near Dover’s Admiralty Pier. Though he was stung by a jellyfish eight hours into his attempt, he persevered after being soothed by a nip of brandy. He swam into the out-rushing tide toward Cape Gris-Nez, which is now often used as the starting point for Channel swims. Finally, after 21 hours and 45 minutes of swimming against the tide—the equivalent of 39 miles--he waded onto the beach at Calais at 10:40 a.m., the morning after he began his swim, exhausted. His achievement was celebrated all over the world. 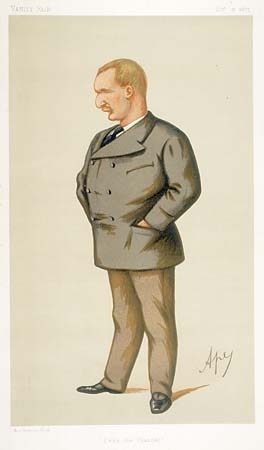 On 24 August 1875 he began a second swim by diving in from the Admiralty Pier at Dover. Backed by three chase boats and smeared in porpoise oil, he set off into the ebb tide at a steady breaststroke. Despite stings from jellyfish and strong currents off Cap Gris Nez which prevented him reaching the shore for five hours, finally, after 21 hours and 45 minutes, he landed near Calais—the first successful cross-channel swim. His zig-zag course across the Channel was over 39 miles (64 km) long.